Running and I have had a lot of ups and downs over the last year(s). There have been quite a few “running is stupid” moments along with fewer “I love running” moments. I’m okay with this. It needs to ebb and flow and not be something that takes over my life. I let running become something too big in my life before. I let it take over. I defined myself almost solely as a runner. I’m a person who runs and enjoys running, but there is a lot more to me and to my life. I had so much running with friends at the Brewer’s Mini. I got to run with friends I hadn’t seen in along time. I ran through parts of Milwaukee I don’t normally run through. I ran into friends from many different points in my life. I remembered why I love this distance. It’s still something you have to work hard to do, but it is so very doable. The Brewer’s Mini was half marathon #15. I can’t really believe that. 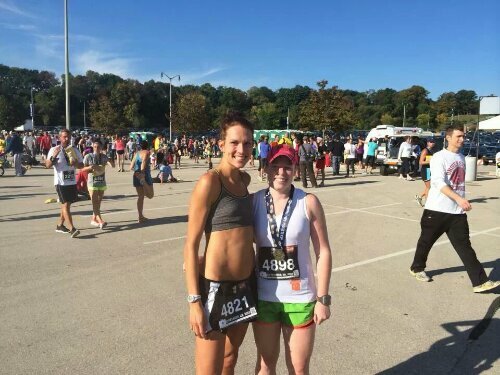 When I set out to run my first half marathon I didn’t know it would become a way of life. I didn’t know it would lead me to meet some of the most important people in my life. Post race on Saturday, when I could barely move, and was waddling around the house (curse the stairs), I decided that my spring race will be the Wisconsin Half. I ran it in 2012 and had a blast with Tracey and Sara. It’s a relatively flat course, much more so than that ridiculous course I ran last weekend. And it’s early May. Lastly, while I did have fun running the Brewers Mini I will most likely not run it again. I was not a fan of the course. It was strange and hilly and ran through some parts of Milwaukee you don’t really want to run through. Plus there are other fun Milwaukee races and other fun fall races to run. I did not remember all those hills from last year! I know it was almost the exact same course, but I think maybe last year it was so cold & windy I was distracted by being miserable with the weather to notice. WI Half has a very FLAT course with a lot more beautiful scenery to distract you with. Love that race! “It’s still something you have to work hard to do, but it is so very doable” Yes, that!! Agree! And I agree with there are so many fall races to choose from. It’s hard to pick! Congrats on #15! Awesome that you won the registration!